Centrally located along I-30 in Texarkana, TX, CHRISTUS St. Michael Health System serves residents of Arkansas, Texas, Louisiana and Oklahoma. 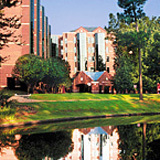 Established in 1916 by the Sisters of Charity of the Incarnate Word, CHRISTUS St. Michael offers a full scope of expansive health care services: heart care, imaging and diagnostic, surgical, orthopedic, rehabilitation, wellness, cancer care, women's and children's services and 24-hour/day emergency services. CHRISTUS St. Michael Health System sits on a wooded, 129-acre campus that includes our 312-bed acute care hospital, 50 bed Rehabilitation Hospital, an Outpatient Rehabilitation Center, a 21,000 sq. ft. Outpatient Imaging Center, and a Health & Fitness Center with an outdoor lap pool. The CHRISTUS Health System was created in 1999 when the Sisters of Charity of the Incarnate Word in Houston and the Sisters of Charity of the Incarnate Word in San Antonio combined their healthcare ministries to better serve the communities where they were located. As a part of this Catholic, faith-based system, CHRISTUS St. Michael is one of more than 40 hospitals, inpatient and long-term care facilities, as well as dozens of clinics and various health care services. CHRISTUS facilities can be found in more than 60 cities in Texas, Arkansas, Louisiana, Oklahoma, Utah, Missouri, Georgia and Mexico. CHRISTUS St. Michael is, and has always been, strongly committed to providing outstanding patient care for over 90 years. It is a part of our Mission "to extend the healing ministry of Jesus Christ." Texarkana is a city in Bowie County, Texas, United States. It effectively functions as one half of a city which crosses a state line ï¿½ the other half, the city of Texarkana, Arkansas, lies on the other side of State Line Avenue. The population of the city is 34,782 at the 2000 census. TEXARKANA, TEXAS. Texarkana is at the junction of Interstate 30 and U.S. highways 59, 67, 71, and 82 in extreme northeastern Texas on the Texas-Arkansas border. It was named for its location on the state line between Bowie County, Texas, and Miller County, Arkansas, only a short distance above the Louisiana boundary. The three parts of its name honor the three states. There is some debate about the actual origins of the name, which was in use some time before the town's founding. According to one tradition, the name was derived from a steamboat known as the Texarkana, which plied the water of the Red River as early as 1860. Others claim that a man named Swindle, who ran a general store in Red Land, Bossier Parish, Louisiana, manufactured a drink called "Texarkana Bitters." Yet another story claims that when the St. Louis, Iron Mountain and Southern Railroad was building its line through the area, Col. Gus Knobel, who made the survey, coined the name and erected a large sign at the site. The strategic position of Texarkana is the keynote to its history and development. The Great Southwest Trail, for hundreds of years the main line of travel from Indian villages of the Mississippi River country to those of the South and West, passed by a Caddo Indian village on the site that later became Texarkana. Seventy Indian mounds, reminders of Caddo occupation and culture, are within a radius of thirty miles of Texarkana. Texarkana has remained a gateway to the Southwest. When the builders of the Cairo and Fulton Railroad crossed Arkansas in the late 1850s and by 1874 pushed their rails beyond the Red River to the border line of Texas, they met there the rail head that had been extended to the state line by the builders of the Texas and Pacific. The road from the south bank of Red River was completed on January 15, 1874, to the state line, where the city of Texarkana had been established on December 8, 1873, at the site where the two roads would join. The Texas and Pacific Railway Company laid out the Texas side of the town. The plat included land from the railroad yards to Seventh Street, and west from the state line to Deutschmann's Canal. The first business, a combination drug and grocery store operated by George M. Clark, opened on December 8, 1873. In 1876 Texarkana, Texas, was granted a charter under an act of the state legislature.